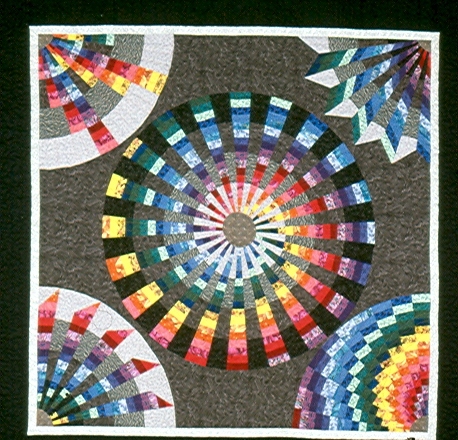 Explore the diverse array of quilt patterns made from one marvelous tool, the 9° Circle Wedge Ruler. Find out how to create all of these designs: Pleated and Fluted, Blazing Fingers, Chevron, Elegant Dresden, Spiral, and more. View numerous samples and discover your favorites. Students can use any size ruler in the class: 34″, 25″, 18″, 14″, or 9″. After viewing the samples and possibilities, you will choose your favorite fabric combinations for each of the designs. Effortless “strata” sewing techniques are featured for quick and accurate results with all designs. An exciting slide show is featured. Class Length: Several choices – each increase in time between Marilyn and her students and allows more to be explored and accomplished. 3-4 hours as a demonstration. Click here to register or for more information! Just completed a two day workshop with Marilyn and it was Wonderful! Fantastic! And most any other forms of praise I could think of. I want to thank her very much for the great experience and the enthusiasm she brought to share with us. Thanks for changing the way I will look at fabric. Loved it!! Can't wait to finish putting my elements together and seeing what I can create! Also looking forward to visiting your B & B.